You Know IoT Data, but Are You Using It to Its Fullest Potential? Learn how to unlock the value in the enormous amount of data generated from IoT and smart devices with our white paper. Analytics is the key to unlocking the potential of your data. Industry watchers estimate that 1% or less of all data available to a business is ever analyzed and used. Why? It’s complex to capture, analyze, and integrate historical data along with streaming data in real-time. And, most organizations don’t have the resources to develop analytic solutions that address their unique business problems and opportunities. Analytics is the key to unlocking the potential of your data. Analytics on real-time streaming data provides the ability to monitor for anomalies, take situationally appropriate actions quickly, improve predictive models, and deliver deep insights to improve business processes. 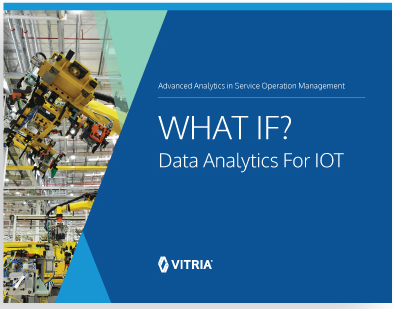 Our latest WHAT IF EBook is a great resource that will help guide you to developing a 6-part strategy to get the most out of IoT data using an advanced analytics strategy. Download the EBook today to start using your IoT and streaming data to improve business performance.